Thanks pal you are welcome to put my stuff up in your blog, at least its getting shared around. 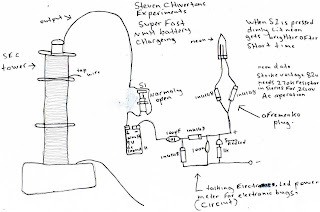 If you think thats great i have video footage of experiments where i can use any transformer any way around as an em pick up via simple vlf receiver circuit and even relay coils and, even ignition coils with there internal soft iron shielding inside the can and around the coil. and when i play a cassette tape right up against the ignition coil the sound from the tape is EM induced right through that ignition coil and through the soft iron shielding and comes right out the VLF receiver circuits headphones , in other words i can listen to a radio through an ignition coil and its easy with relays to as the coil in it is my em pickup coil and thats interesting . and the same VLF receiver circuit allowed me to listen to the em RF energy from the sec exciter tower to its a hum a little slower than mains hum thats what i hear . The first circuit is a slightly modified led power meter from a talking electronics site normally the led power meter is used to tune bugging devices to put out the peak power something like that, but after i modified it it now charges nickel metal hydride batteries fast when used with the sec coil towers output ive only tested this a few times so more needs to be done yet since it worked on a bread board. 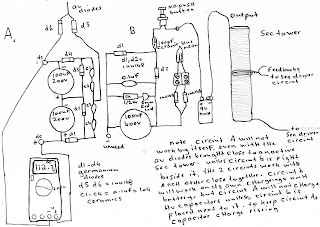 the next circuit is the free energy from air circuit with hv caps and another slightly modified led power meter with added afremnko plug and nmh battery.